When I became parent, the word “simple” was erased from my vocabulary. Getting dressed in the morning takes so long that we rarely leave the house before lunch. Short trips became epic adventures and quick questions evolved into lengthy discussions. It’s no wonder that parents resort to the universal response of “Because” to silence little inquiring minds, especially when those parents (this one in particular) just don’t know the answer. Never fear, answer-lacking parents and overly curious children! The wicked smart developers over at KIDS DISCOVER are back to help your kids – and you – learn all about simple machines. (No, it doesn’t mean you’ll finally learn how to use your coffee maker.) 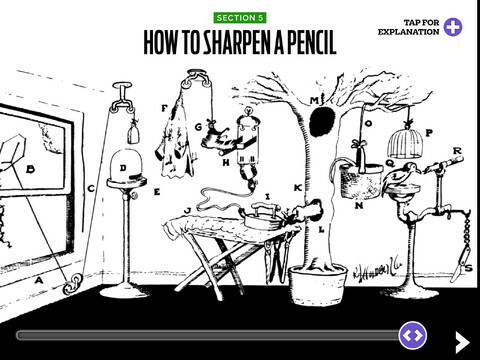 We’re talking wheels, pulleys, planes, the screw – basically anything that makes work simpler. KIDS DISCOVER has already tackled some pretty intense topics, from star-studded galaxies to a nation’s capital that’s busting with history. 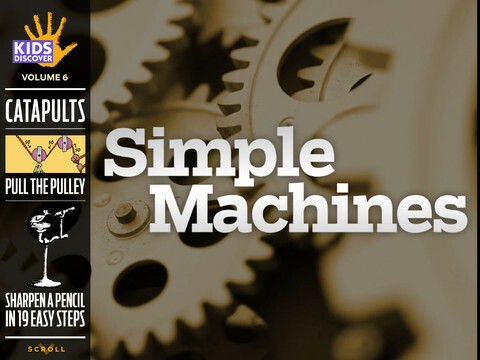 Simple Machines follows the same successful format as the other apps; including amazing visuals, fun facts, and kid-friendly written explanations. Fun games and quizzes round out the learning experience. My 5-year-old son needs to know how everything works. Like, right this very second or the world will surely end. He’s incredibly science-minded and was pretty excited that I downloaded a “pulley app”. He’s not reading yet so I stepped in to save the day, but he really enjoyed the cartoons and pictures. After fully exploring the app he walked around the house pointing out all of the simple machines we have in the house. Simple Machines is another All Star from KIDS DISCOVER. Not only is it a great app for kids, but parents will also learn (re-learn?) a thing or two. At $2.99 it’s definitely well-priced for the amount of content. And I guarantee at least 3 minutes of stunned silence when you actually give the kids an answer that’s not “because”.